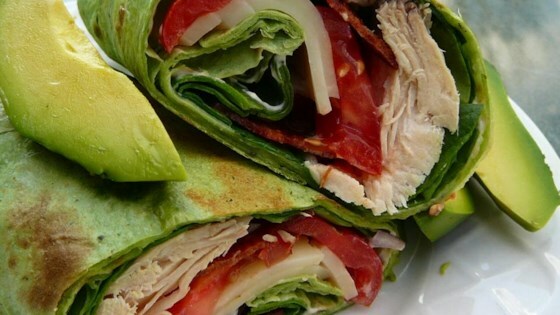 "I work in a corporate office, and our cafe has a 'wrap station' every Friday and these are a huge hit with everyone. I got hooked so I watched closely and finally made my own version at home; they are so delicious! If desired, place wrap in a panini maker for 1 to 2 minutes, or until wrap has grill marks and cheese is slightly melted." Whisk mayonnaise, yogurt, and chipotle chiles together in a bowl. Cook tortillas in the microwave until warm and pliable, about 30 seconds. Spread 1 tablespoon chipotle mayonnaise down the center of each tortilla. Spread 1/2 the lettuce, 1/2 the Monterey Jack cheese, 1/2 the avocado, 1/2 the bacon, 1/2 the red onion, 1/2 the tomato, and 1/2 the chicken, respectively, in the center of each tortilla. Fold opposing edges of the tortilla to overlap the filling. Roll 1 of the opposing edges around the filling into a wrap. Also try with chipotle ranch sauce. Substitute 1/2 cup ranch dressing for the mayonnaise to make the chipotle ranch sauce. The nutrition data for this recipe includes the full amount of the chipotle mayonnaise ingredients. The actual amount of the mayonnaise consumed will vary. This made a delicious wrap, but I overfilled it, would reduce amounts next time. Substituted baby spinach for the lettuce, otherwise followed the recipe. Will make this again.